What makes this camera so special? It has, as one of the first Soviet SLR's, an aperture priority program, just set the aperture and the camera figures out the speed. An impressive achievement. Esspecially since programs were pretty new in the late seventies. The Lomo appeared in 1983 and the Kiev 35a only in 1984/1985 but there were other cams with programs, lets not forget the Zorki 10 which made its debut a lot earlier, in 1964. But in the late seventies programs on cameras became a normality, but the 18 was special. 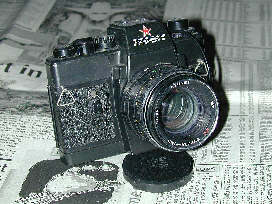 It also carried a lens with electric contacts, a first in Soviet M42 optics. In fact the lens the Zenitar ME 1.7/50 mm is even considered more rare than the camera. The contacts are there for the camera, so it can work the program with the lens wide open. Immediatly the question, "Does the program work with other lenses?" pops up. And I can safely say, yes it does. But you have to stop the lens down. And here it is, the Zenit-18. This example saw a lot of action, but is still fully operational and has something interesting. A Databack. At first I thought this had to be a hackjob, only the Zenit-Suprise used a databack. 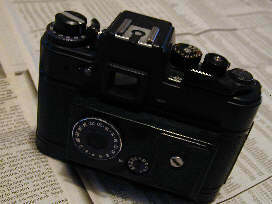 But this Zenit-18 was original, the 18 has rubbed off but text can be restored. The meter works but the needle doesn't, small problem... But what do you expect.... this camera has seen a lot of action and now I must restore it. Not only for myself but also as a small token of apprication to the KMZ Engineers who built this magnificent camera. This is the camera that laid the foundation for a new breed of Soviet Cameras. After these last great M42 cameras came the Automat line, Auto, Automat, AM, AM2, AM3, AN, AP and APK. iso settings on topcover, on the filmrewind collar. 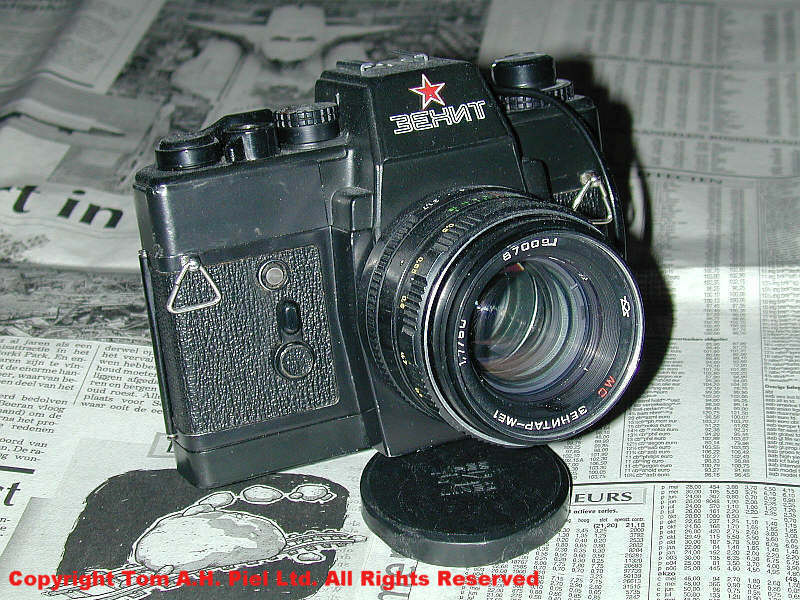 The Zenit-18 and the Zenit-19 were the best of the best the Soviet Camera industry could make in M42 mount. And believe me if I say that they rank among the BEST of M42 cameras. Even the great 12 series doesn't come close to the 18 or the Mighty 19. The Camera has a nice feel to it, but I really miss the DOF button. It is in fact the only drawback on the whole camera I can find. That and the batteries. The 19 takes two batteries, well... the 18 takes FOUR and another THREE for the databack. Its a little powerhungry. But the program, allthough I sometimes hate programs, does make up for it. This article is a beta release, I still have to shoot with the 18 repair a few things..... so stay tuned.